Hello again good people and thanks for sticking around for Part 2 of our Edge of Extinction double episode. 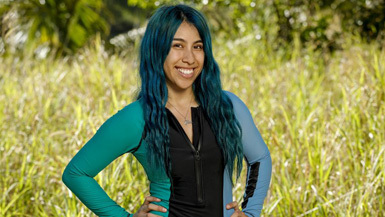 Quickie recap - the season showed signs of life in the first hour and Aubry went to Extinction with an idol and an extra vote. That's gotta hurt. Probst Sighting!! Shock is in play when they see Aubry gone. Joe suggests that Kama-Strong is no more. Today's reward challenge will see the players jump over some table obstacles until they get to a knot tying station. Free a lever and pull down a bunch of sandbags. All sandbags have to get into a bin before they can start the carnival game of sandbag target throwing. First team to hit the targets enough to raise 2 flags wins reward - coffee and pastries. Second place gets some iced coffee and cookies. Third place - got nothing for ya. I'd break down the entire challenge for you, but what's the point. Joey Amazing is, once again, amazing and Kama wins reward. The other 2 are playing for second place and Gavin, he of the sweet pineapple shirt, proves to be pretty darn good at a carnival game as well and Manu wins second place. Lesu, not even close. And in fact, they pretty well embarrassed themselves. Well, not to much the entire tribe, but Wardog for sure. Not sure The Wardog has ever thrown a baseball. Not only did he miss the target most of the time, when he did hit it, it went backwards. Lauren is the only one for Lesu who actually hits the targets, but it was too little too late. Once again, Lesu will be hungry today. If the Survivor Gods are at all merciful, they'll merge soon to stop the bleeding. It's time to watch Kama celebrate another reward. Everyone loves Joe for all the wins, but he's not really feeling it. He wants their protection once the merge comes, but he doesn't expect to get it. And he shouldn't. If he loses a challenge, he's gone. Period. End of story. We get a confessional from him where he breaks down a little with Aubry being gone. He is feeling utterly alone out there. And honestly, he probably should. He is target #1. And there's really nothing he can do about it. But he gives it a shot. He is alone with Julia and actually makes a pretty solid pitch to her. He suggests to her that he and she are BOTH big threats in this game and they'll both be targets after the merge. This actually gets her thinking a little bit. She doesn't want to be a threat in this game. Maybe she needs to change it up a bit. Lesu is wallowing in their misery. David wants to do some fishing. No one else seems all that interested in it. Lauren is starting to lose it a little. She hates the camp, the rice makes her sick and she's crying a lot. The Wardog tells us how he thinks that fishing is waste of time. It wastes energy that they need for the challenges. He is worried about Lauren, though, and decides to try to get Kelley and David on board to take Lauren out when they lose again. They're returning players, so naturally they agree. But in a conversation alone neither one of them are feeling The Wardog. He does nothing around camp except trying to strategize and number crunch all the time. And out of necessity, a new alliance is born. David and Wentworth lock it in and decide to ride or die. Should have done this from the beginning, but let's see how it works out. Oh joy, we get to check in on Bitter Island aka the Edge of Extinction. They have more maps. Reem is complaining that they need to wait this time to go look. Everyone starts folding the maps, but it's different this time. They go looking and there's nothing there. Devens is smarter than the rest. He realizes the key for this map is different, he lined up all the holes on the map and this one is on the beach. But apparently, he's not smart enough as he's digging around the mast and comes up empty. Keith and Reem are on the beach and she sees something floating. Keith grabs it and that's how the advantage that Reem found somehow became Keith's. His "advantage" is to give a bunch of knots for 1 player to have to untie when they battle to get back in the game. And next is an amazing blow up from Reem because as she's complaining about how she found the advantage but Keith got it. So Chris kinda jokes about how she gave him the advantage and now she's pissed and yelling and cussing at Chris. Why? Because she's an idiot, she's bitter, has no chance to get back in the game and the teeny tiny little shot she might have had, she gave away.